You can download it via torrent on mininova.org. I start coding "Volumetric Material" for blender (not GE this time). Now, you can make your own 2D Filter. Download game_engine latest windows build in downloads. Thanks Oviduo for this patch. the patch speeds up opengl display lists. 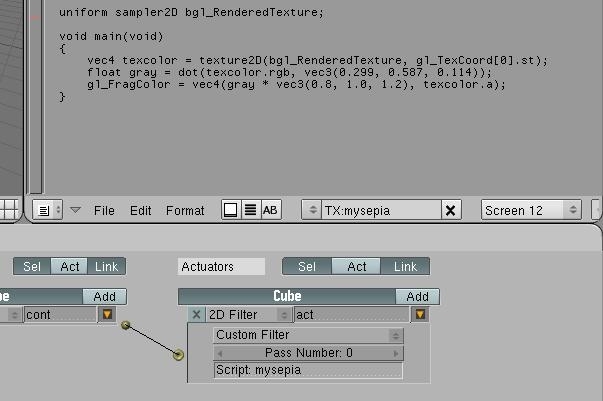 Now you can get blender game engine branch with 2D Filter. Congratulations to me and "centralnoise", we are now a blender developer, and work on game engine branch. Thanks "kaiowa" for building linux build with 2D Filter support, you can find it here. 2D Filters was completed to night, i'll create the patch as soon as possible. to see 2d filters in details see 2D Filter page.